To improve business performance and patient care, hospitals and clinics are faced with the need to provide ever more efficient and always accurate medical treatment. In response, Intel Corporation came up with Mobile Clinical Assistant (MCA) reference architecture, a platform especially designed to facilitate modern healthcare. The CF-H1 is a tablet PC based on Intel's MCA architecture. Panasonic extended design experience and technical know-how accumulated during the development of the TOUGHBOOK fully-rugged series. Developing new materials and special design features, we created the kind of tough MCA that meets the needs of healthcare professionals. Here, you can find out some of the secrets of the exclusive rugged design of the CF-H1. The CF-H1 was designed for practical use in clinical settings. Rather than extreme toughness, it balances ruggedness with light weight. The body is fabricated from light weight but extremely strong reinforced polycarbonate resin. Polycarbonate is a type of thermoplastic. Used for aircraft windows, it has 200 times more impact strength than glass and 6 times more than acrylic resin. Inside the body, the PCB is protected by a magnesium alloy plate. In testing, this fully reinforced structure has been proven to withstand 90 cm free-fall drops. In this way, we have succeeded in achieving both light weight for portability and the strength required for the inevitable knocks that the unit will receive during use. Equipment used at the bedside has to be cleaned and disinfected. Naturally, the CF-H1 is designed to be wiped with disinfecting agents. From the start, priority was given to keeping water out. A fanless design was necessary to avoid the need for a vent. As well as stopping the entry of drips during cleaning, not using a fan also does away with the risk of sucking in and expelling possibly infective dust. Consequently, the unit can be easily used right at the bedside. Drip-proofing is also needed to protect the interface connectors. It is important to have effective port covers. The CF-H1 uses the same type of locking covers that have proven themselves in the TOUGHBOOK fully-rugged series CF-U1. The sliding covers are firmly secured shut with a catch that locks on the inside. To tolerate wiping with disinfecting agents, the CF-H1 has to withstand contact with chemicals. Naturally, it has been designed for wiping with alcohol, hypochlorous acid. To ensure that the casing of the unit does not deteriorate, we have used a newly developed surface material. Moreover, to conform with Intel's MCA architecture, the CF-H1 has a white body. Resistance to chemicals also extends to the LCD. Normally, to prevent scratching during fingertip or stylus operations, LCD touch panels are laminated with a protective resin film. The usual resin films would soon deteriorate if wiped with disinfecting agents. To ensure complete protection, instead of the usual resin, the CF-H1 has a glass film on the touch panel. 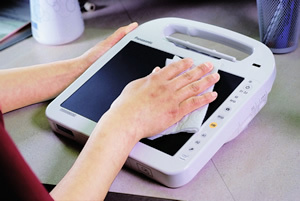 Consequently, the touch panel can also withstand frequent disinfection. The fruit of a number of new technologies ripened in close consideration of use in clinical situations, the CF-H1 is a mobile computer with a rugged design for medical use. This outstanding design has been successfully realized by applying know-how acquired during the development of the TOUGHBOOK fully-rugged series. The shock resistance, vibration resistance, dust-proof, splash-proof, and chemical resistance functions are not a guarantee against damage or malfunction.